Nitty Bitty "Tooth Fairy" Mini Kit is a unisex tooth fairy kit to help your child or grandchild celebrate this great moment in their life! 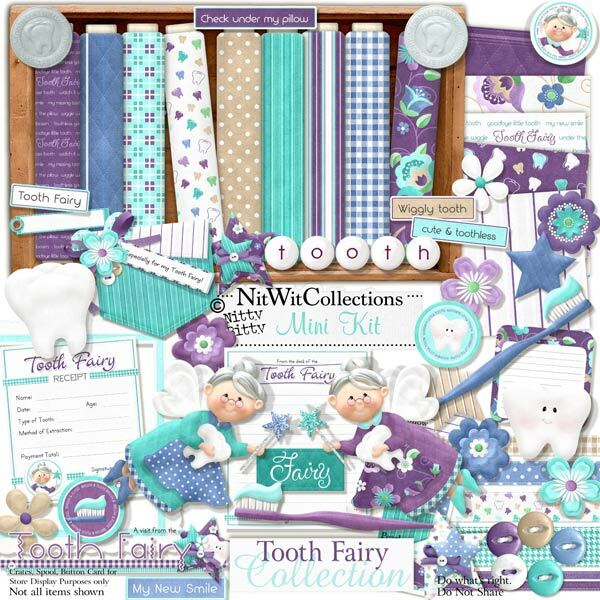 Yes our darling little tooth fairy lady will help you to capture this event by aiding you with all of her accoutrements in this Mini Kit. The toothbrush and tooth are obvious elements for this kit, but be sure not to miss the "tooth receipt"...you don't want to be labelled a tooth burglar!! Did the tooth come our easy or was it the old "tie a string around it and close the door method?". Trust me, the layouts and cards won't be that hard to come out of your creative mind. 5 Buttons - you can't button the tooth back in once its out! 3 Stickers - maybe a good idea to stick one on the date it happened! 1 Wordart - "A Visit from the....."
1 Word dots - "Tooth"